The stories of our athletes vary widely, and we’re taking the chance to profile how they found their way to the top. In this piece, UAP veteran, Grand Masters player, and UAP Premium mentor Chris Cleaver tells us how time in the US Army helped develop mental toughness and a realization that took his game to a new level. Having played competitive ultimate for 25 years has taught me some things—about the game, about myself, and about training. And 9 years in the U.S. Army taught me many things, mostly about myself. One of those is mental toughness, a quality that everybody either knows they have, thinks they have, or knows they need to build. The simplest definition of mental toughness for an athlete is the ability to perform difficult, complex tasks under pressure. Like making 3-point baskets in the playoffs, kicking field goals in the Super Bowl, or in our case, executing accurate throws and solid catches in ultimate tournaments, particularly when tired (think game 4 on Saturday or game 3 on Sunday). Now, hitting 3-pointers and kicking field goals are difficult tasks under ideal conditions—I know, because I’ve done both. Throwing the disc so it’s catchable 90% of the time, and catching the disc 90% of the time are no easier, especially in a game-to-go. Mental toughness takes years to develop, so if you fear you don’t have it now, don’t worry—you may not have all you need at the end of this season, but as Melissa is always saying, “Progress, not perfection.” If you make fewer turnovers late in games at the end of summer than you are doing now, that’s improvement! You have to take a long view of it and ask yourself, “Where do I want to be in 2 years? Or 3?” And then design a plan (or have someone help you do so) and execute it. Think back to the above definition of mental toughness, and remember that your ability to do tasks under pressure is strongly correlated with your belief that you can do them. A quote by Henry Ford reminds us of this fact: “Whether you think you can, or you think you can’t, you’re right.” Knowing you can comes from having done it before, in games and in practice. I suggest you decide on between one and three things you really want to improve this season, and drill those things until you can’t stand the drills anymore. Then drill them some more. I’ll give an example: I tried and failed to make an AUDL team in 2012. The first thing I did was start lifting weights and the second thing was build a 27-inch square target that I could throw at when I didn’t have a throwing partner (which turned out to be the rule rather than the exception.). I had about 20 discs from tournaments and leagues around the house and garage, and I used them all. Experience had taught me that 90% of my throws in games and tournaments were forehands and backhands that travelled <10m. So, guess where I spent 90% of my throw training time? That’s right, 10m forehands and 10m backhands, 100 each as often as possible (3-4 days a week). I eventually noticed that my throws were significantly better, which speaks to the concept of muscle memory. Knowing I can execute throws and catches at league and pickup gives me the confidence that I can do it in tournaments, even important ones, even in the games-to-go. And I have done just that for the last 3 or 4 seasons with my grandmaster team. I play a lot of minutes on the O and D lines and I’m always out there when the game is tight. Serving for 9 years as an Army Infantryman taught me two major things. One, knowing my “limits”. Most people never come close to their full potential, because we like our comforts too much, and more importantly, we really dislike being uncomfortable. Uncomfortable is a way of life in the Army, especially in the Infantry. As athletes, we need to be okay with uncomfortable. Get out and train when it’s cold, or raining, or whatever. Knowing (and extending) my limits, and trusting that my body can take just about anything if my mind allows it, makes me supremely confident, which is indispensable when the game is on the line. 10 years ago, I was playing winter league in Maryland, and my team was playing basically savage. A young guy asked me, “How are you still playing, and playing so well? This weather stinks.” I said, “Dude, I’m not really that tough. I’m trained to ignore the weather, and minor pain, and just do what needs to be done.” He said, “That’s pretty much the definition of tough.” Seek out opportunities to play and train in poor conditions, or on teams that have a really short bench. These things decrease comfort levels, and increase your confidence that you can perform in difficult situations. Remember, it’s only a game! The second major thing I learned is that competition on a sports field is of small consequence when you’re used to competing for your life. The lesson here is RELAX—it’s called “playing” for a reason. Remembering that it’s a game gave me a perspective I hadn’t had before, to just have fun. I improved significantly once I started applying that principle. Compared with my Army time, an ultimate game is no big deal—there’s always another game, another tournament, another season. Enjoy it, embrace the moment. Nothing you do will cost the team the game. A game is the totality of the successes and mistakes of up to 40 people, and you can only control the actions, thoughts and attitude of one of them. Most of this piece is from personal experience, but some of the general principles are borrowed from Dr. Alan Goldberg, particularly this piece on mental toughness. 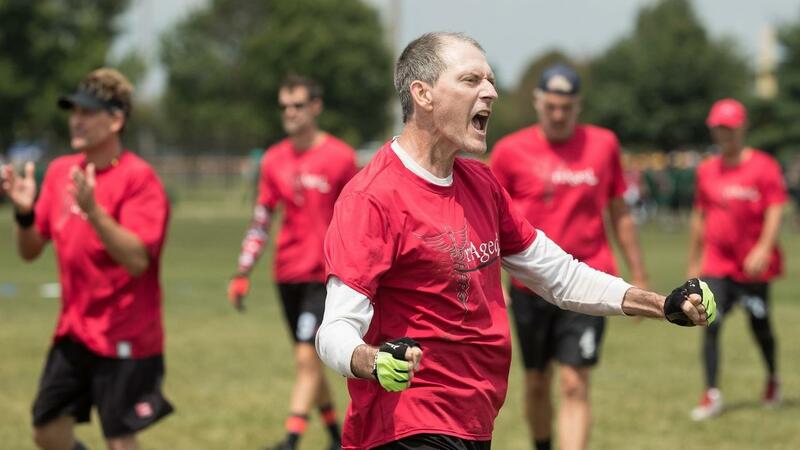 Chris Cleaver learned to play ultimate in 1990, and started playing competitively 5 years later in Washington D.C. Summer League. He helped start a club team in Alabama in 2004 and an Army league in 2005, both of which are still going. He first played Masters ultimate in 2011, and Grand Masters in 2014, for Grand Master Flash, his current team. Chris is available for mentoring other athletes via our UAP Premium offer. With many years of playing experience he would be an excellent fit for you if you want to work on your mental game before tryouts. As a veteran of the UAP, he is the perfect guide for a first time UAP user.